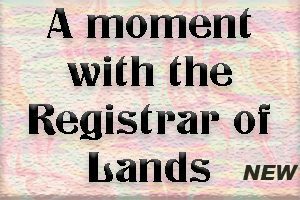 Why did so many people across the region find it so difficult to make sense of Montserrat’s recent request to remain on the UN Decolonialisation list? BRADES, Montserrat – It is astonishing to see how a recent request by Premier Donaldson Romeo to the UN Decolonisation Committee to withdraw a request by an earlier Premier to be removed from the list of seventeen remaining Non Self-Governing Territories was widely misunderstood across the region. Much of our local discussion was also sadly misinformed. It is as though the UN Committee that was meeting in Grenada with the territories on the list were instead a “RE-colonialisation” Committee. But, obviously, it is a DE-colonialisation Committee. One, that acts under Article 73 of the UN Charter and linked General Assembly resolutions, especially 1514 and 1541 of December 14 & 15, 1960. The UN Charter, of course, is the cornerstone of modern International Law; as, after two ruinous world wars in 1914 – 18 and 1939 – 45 devastated continents and left up to eighty millions dead it was felt that relations between the nations had to be re-founded on principles of peace. As a part of that re-founding, it was recognised that seventy-two territories were under rule by other territories and that such rule was too often oppressive, abusive and unjust. There is a reason why “Colonialism” is a dirty word. The UK has apparently taken the view – after its experience with Antigua and other EC states from 1967 on, that “Associated State” status should be tied to a definite date for independence. However, as the annual reports also point out, in 2015, the Joint Ministerial Council (JMC) communicated the view that remaining UK OT’s enjoy constitutional democratic governments and a “modern relationship” with the UK. (Fair comment: this seems to be a name for a weak form of Associated State!) Also, the recent passing of an Act by the UK House of Commons mandating public beneficial ownership registers in OT’s has raised serious questions in many minds here and in the other OT’s. The decolonisation issue, obviously, is not settled. Premier Romeo, has long said that one of his main goals is for Montserrat to “stand up on its own two feet” economically. 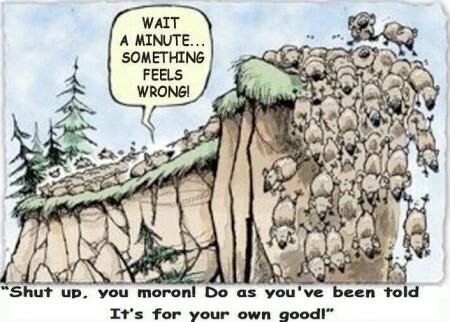 Clearly, economic self-sufficiency is a key step to self-government: he who pays the piper calls the tune. 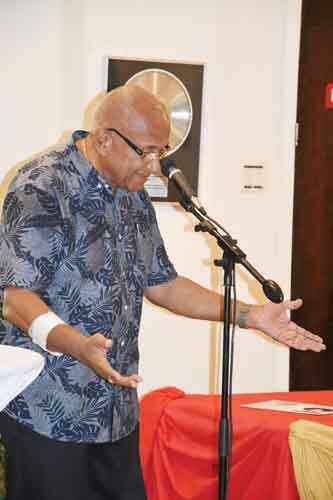 So it is no mystery why the theme of the 2018/19 Budget is “Advancing our Journey to Self-Sustainability through Strategic Investments.” In this budget, Mr Romeo has therefore announced five “breakthrough” initiatives as key steps towards self-sufficiency: 1] the sea port breakwater, 2] subsea fibre optic cable, 3] geothermal energy development, 4] EC$ 60 millions from the European Union (to go with EC$ 54 millions from the UK for the port) and 5] the ten-year Economic Growth Strategy. The Premier also intends to speak before the UN and to invite a visit by the Committee, obviously to request much-needed development assistance. Now, too, the UN has a publication, “What the UN Can Do To Assist Non-Self Governing Territories.” Montserrat is listed in it as an associate member of UN ECLAC and UNESCO, the UNICEF EC office has Montserrat on its beat, UNDP (acting through CARTAC) has helped us, we can apply to UNEP through its Panama City office, FAO has an office in Barbados, we routinely work with PAHO/WHO. ILO (International Labour Organisation) services are available to us, and doubtless UNIDO (the UN Industrial Development Organisation) will be equally willing. The IEA (International Energy Agency) though technically not part of the UN may be helpful too. Some years ago we received a technical mission from the IMF. Beyond the UN, regional agencies such as OECS, ECCB, CARICOM, UWI, CDB and more are quite willing to work with us. Obviously, the JMC of the other OT’s and the UK is another key contact and through it we may find ways to work with other UKG Departments, not just DfID and FCO. 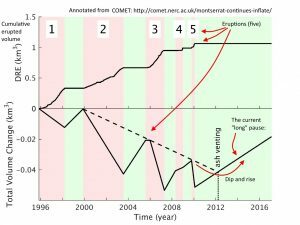 History gives a yardstick: it took twenty years from the 1960’s to 1980’s to modernise our economy sufficiently for us to fund our recurrent budget. (We were still heavily dependent on the UK for development aid.) But, the volcano struck and we lost 2/3 of our people, lost access to 2/3 of our land, lost much of our key infrastructure and housing, etc. Our power station went out of use. Our refurbished and upgraded hospital was lost, as was our brand new Government Headquarters. A project to greatly expand the W H Bramble Airport was killed by the eruption and the just completed replacement jetty for the one lost to Hugo in 1989 was rendered largely useless. Our economy is half what it was in 1994 in “real” terms, investor confidence is low and with many key initiatives delayed for twenty years, DfID has not given us a vote of confidence as a good development prospect. So, we have a much more difficult development challenge today than back in the 1960’s – 90’s. Clearly, the UN can help us meet the challenge, and the legal force of the UN Charter Article 73 provides urgently needed balance to the bureaucrats in DfID and FCO. Yes, better infrastructure and a supportive climate will attract catalytic foreign investments, too. But in the end it is we of Montserrat who must work together with one heart and mind, to create economic self-sufficiency over the next ten to twenty years. BASSETERRE, St. Kitts, May 10, CMC – The United States, through the Caribbean Basin Security Initiative is partnering with regional governments in an effort to stem crime and violence by focusing on at risk youths and vulnerable populations. This is according to Christopher Cushing, the Mission Director for the Eastern and Southern Caribbean, who was delivering remarks on Thursday on behalf of Linda Taglialatela,the US Ambassador to Barbados, Eastern Caribbean, and the Organization of Eastern Caribbean States (OECS), during the opening ceremony for the Caribbean Basin Security Initiative 8th Meeting of the Technical Working Group on Crime Prevention . He said the partnership will be done through programmes that will empower young people to lead better and more positive lives, which will redound to the benefit of the region in improving citizen security and creating more stable democracies. 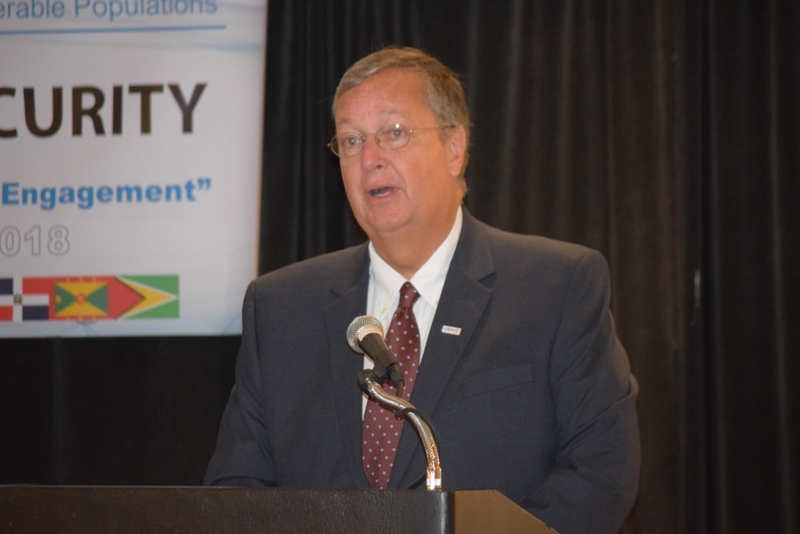 “Since 2010, the U.S. Government, through the Caribbean Basin Security Initiative (CBSI), has invested US$437 million, towards improving citizen security in the Caribbean and addressing the root causes of crime and violence. To date, more than 30,000 youth, across the region, have participated in CBSI education and work-force development programmes, with more than $50 million allocated to support these programmes, he said. Cushing noted the importance of the conference to the future development of youth and citizen security and said that the Technical Working Group is critical to advancing the said goal. He commented on the theme adopted for this year’s conference, which is: “Changing Social Norms Through Youth Engagement”. The Conference, which runs from May 10-11, will culminate with a youth rally on Saturday. Representatives are drawn from Antigua and Barbuda, Barbados, the Dominican Republic, Grenada, Guyana, Jamaica, St. Lucia, St. Vincent and the Grenadines and host country St. Kitts and Nevis. The Community Family and Youth Resilience Programme, OECS Commission and USAID are also represented. GEORGETOWN, Guyana, May 3, CMC – Secretary-General of the Caribbean Community (CARICOM) Ambassador Irwin LaRocque described the presentation of credentials by Indonesia’s Ambassador as “a hallmark in relations” between the Community and Indonesia. Drs. Dominicus Supratikto, who is based in Suriname, became the first Ambassador of Indonesia to CARICOM when he presented his letters of credence to the Secretary-General on Wednesday at the CARICOM Secretariat Headquarters here. LaRocque said that with this accreditation, relations between Indonesia and CARICOM would only go from strength to strength. Both the Secretary-General and Ambassador Supratikto agreed that climate change was one area that lent itself to co-operation. The Ambassador noted that the forming of official links allowed for more engagement between the two parties and this latest initiative was in keeping with Indonesia’s thrust to extend relations with non-traditional partners. Why has DfID pointed to “gaps in GoM’s project management capacity”? But it is also quite clear that such a remark was doubtless informed by concerns over the Montserrat Development Corporation (MDC) and the pattern of delays with the building projects for Agriculture, for Customs & Revenue and for Radio Montserrat (ZJB). DfID would also have been aware of significant problems with the road improvement project. Even more tellingly, by January 2014, questions were already being asked about how health care in Montserrat was to be financed going forward (which eventually led to the now infamous Mott-MacDonald study). 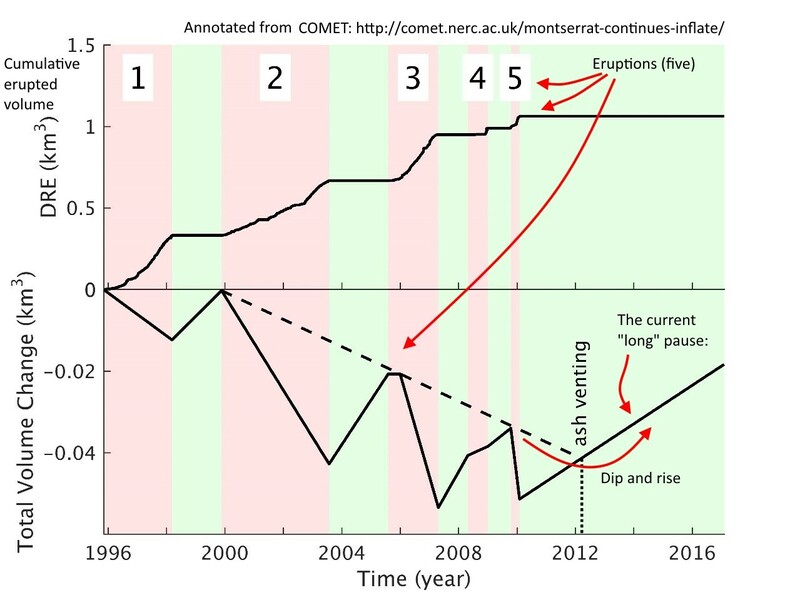 It is therefore fair comment to conclude that Montserrat has a significant, longstanding challenge with project governance (and with linked capacity and credibility). The Programme Management Office (PMO) that was introduced last year was clearly an effort to address this challenge. It sought to do so in key part through consultancies and the introduction of PRINCE2 and other Axelos project, programme and portfolio management frameworks, training and certification. However, our governance problem then exploded into crisis, through the firing of the first Head of the PMO by frog-marching him out of Government Headquarters. And that, on a “no cause clause” dismissal. Since then, the PMO has obviously stalled, to the detriment of ready small and major projects. How can we restore credibility, build capacity and reform project governance? A good place to start is obviously the PMO and the Axelos system for project, programme and portfolio management. A new head is needed and the dropped strands of work with Axelos and International Project Management bodies have to be picked up. Since the Axelos framework is designed to be tailored to circumstances, it needs to be explicitly integrated with EU-style Programme-based Project Cycle Management. We will obviously need to develop a robust system for expediting – as opposed to delaying and obstructing – work on the key priority projects. Procurement and financial management reforms need to be tailored to fit with the needed expediting also. 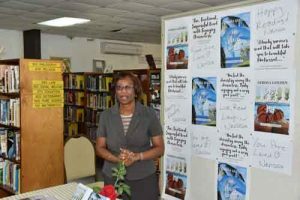 For the past nine years the University of the West Indies Open Campus here in Montserrat has been organizing an inspiring Literary Festival. Led by Campus Head Gracelyn Cassell, the Festival is dubbed Alliouagana Festival of the Word after Montserrat’s original Amerindian name, and takes place in November each year. 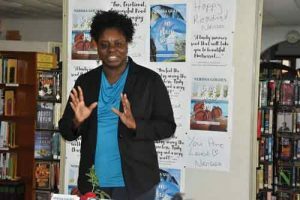 Last November’s Festival was entitled “Telling our Stories” and as the name suggests focused on all aspects of storytelling. For the first time the Festival teamed up with the Ministry of Education’s Reading Week, and this featured an impressive Book Parade in which children from each school wore costumes depicting storybook characters. The parade started in Carr’s Bay area and ended at the Basketball Complex in Little Bay, with a host of imaginative costumes. In addition some of the visiting storytellers from the “Lit Fest” visited the schools and met with school children for stories and interactive discussions. 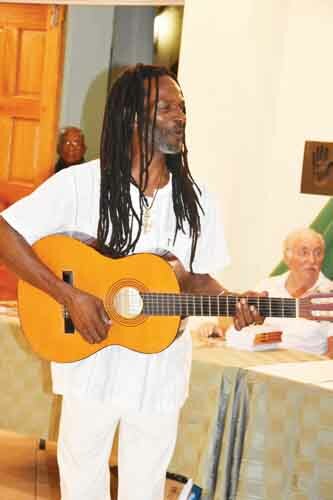 The big event on the Thursday afternoon was the Memorial Symposium, continuing the annual lecture series held in recognition of Montserrat’s hero and international singing star, the late Alphonsus “Arrow” Cassell. For the first time the symposium started at 2pm, in order to facilitate school children’s attendance, and this did attract a good number from three schools, some of whom participated well in discussions. 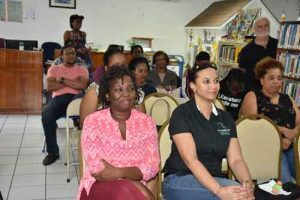 The symposium featured seven resource persons from the Caribbean and further afield, all touching on storytelling from different angles. 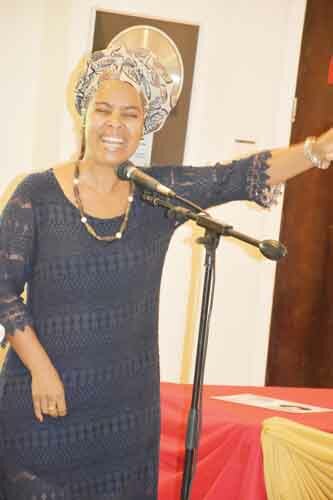 The keynote speaker was Dr Amina Blackwood- Meeks from the Edna Manley College in Jamaica. 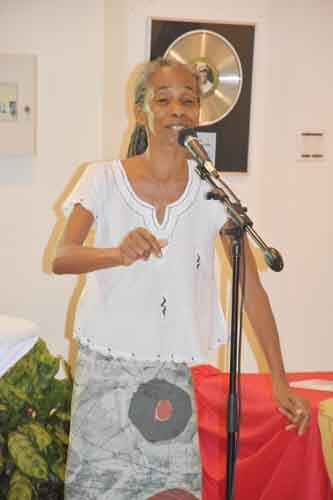 In her presentation “Forgetting we-self”, she pointed out that here in the Caribbean we are still singing about “dashing through the snow in a one-horse open sleigh” instead of focusing on themes more relevant to the Caribbean. Jamaican storyteller and dramatist A-dZiko Simba Gegele, well known locally, told an entertaining story, while Antiguan bookshop owner and reading promoter Barbara Arrindell, a long time supporter of the Festival, spoke on “Presenting our history”, and also played a part in other sections of the Festival. Other speakers included Nicole Plummer from UWI, Jamaica, who spoke on “Constructing knowledge through storytelling”, Wendy MacBurnie from Howard University on “Filmic folklore and storytelling in Slumdog Millionaire”, and Gracelyn Cassell herself, the main organizer of the Festival, whose topic was “Hot Hot Hot: Arrow’s story revisited”. 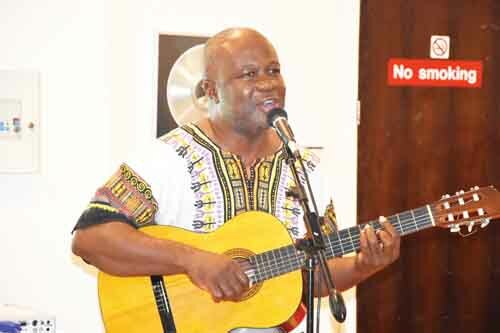 Akini Gill from the University of Trinidad and Tobago talked about his personal experience growing up as an unrecognized dyslexic, and how he now teaches children with learning disabilities through music. 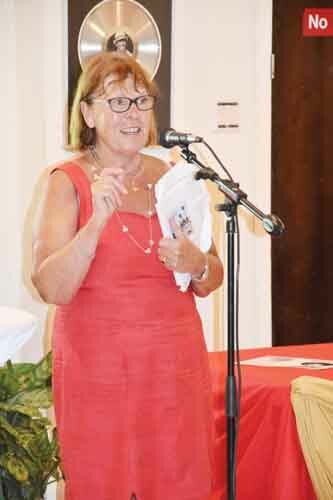 Friday saw the official opening of the Festival, starting with a reception hosted by Montserrat’s then Governor, HE Elizabeth Carriere. 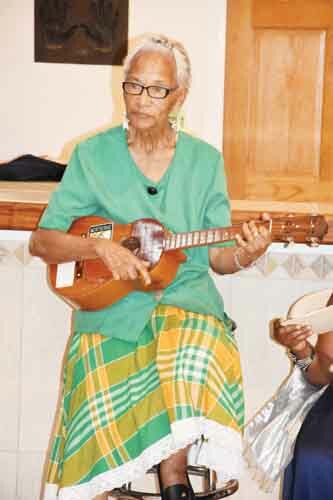 Welcome remarks at the opening were given by Minister of Health Hon Delmaude Ryan, the official Patron of the Festival, and there was enjoyable entertainment from Montserrat’s traditional Masquerades and from three of our veteran calypsonians, Cupid, Tabu and Belonger. 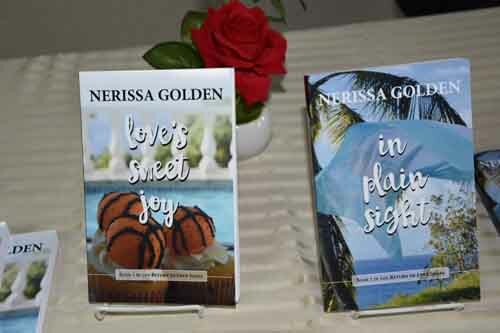 A highlight of the opening was the launch of two books. Claytene Nisbett presented her book “Life as Josephine”, depicting the life of a young black girl as she grows up in the US and later in the UK. 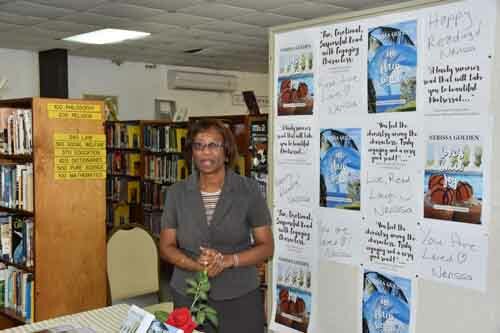 Sarah Dickinson presented her new book “Plenty Mango”, illustrated by her husband, John Renton. In the book she takes a sardonic and light hearted but sympathetic look at many aspects of Montserrat life, with several well known characters being mentioned. The weekend was as usual full of interesting activities and presentations. A new feature of the Festival was an imaginative dramatization of the children’s book “Who’s in Rabbit’s House?” This was organized and coordinated by Pat “Belonger” Ryan with support from parents, especially Mr and Mrs Rolando Kassie. Children took the parts of the various animals in the story, which was narrated by Hayley-Shai Kassie in front of creative scenery made by parents and the “house” built by Kirk Brade. Another new and quite challenging event was a spelling and reading competition for children, entitled “Spell-like a champion”. This was sponsored by book publishers Harper Collins, whose first time involvement in the Festival was greatly appreciated, and who generously donated books for the prize winners and other children. The event was coordinated by Barbara Arrindell and librarian Sonja Smith. 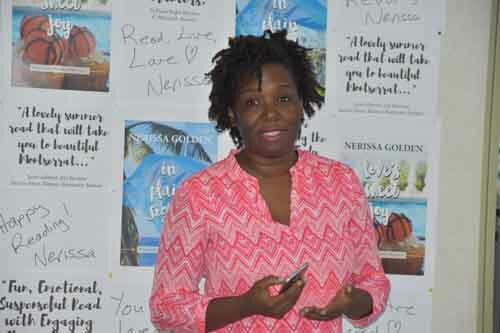 There was also a dramatic event put on by Brandelle Knight and a group of secondary students and these all received books donated by CODE (Canadian Organization for Development through Education) who have been another sterling supporter of the Lit Fest. An annual feature of the Festival is the prize giving ceremony for the Montserrat Volcano Observatory (MVO) creative writing competition. This year the children, and some adults, competed to write poems on the theme “Restless Earth”. There were over 170 entries, many of them illustrated, so the judges had an extremely hard job, as there was a high standard throughout. Prize winners read their poems to an appreciative audience. The competition was ably coordinated by MVO information/ outreach officer Natalie Edgecombe. 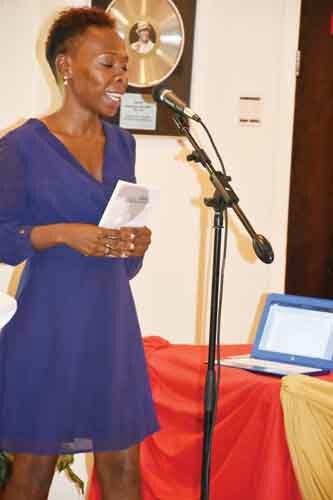 There were several other interesting sessions during the weekend conducted by Sarah Dickinson, Barbara Arrindell, A-dZiko Simba and Nigerian born author/ story teller Atinuke Akinyemi, who kept the audience spellbound. Well known Trinidadian comedian Paul Keens-Douglas wrapped up the Festival with his lively performance “Let’s tell stories”. As usual a host of interesting books for children and adults, many of them with Caribbean themes, were on sale at the UWI bookstall, and also from Barbara Arrindell’s Antigua bookshop, Best of Books. There was a lovely display of crafts by Juliana Meade, and as always Claude Browne’s bouncy castle was there for the children’s enjoyment. I would like to encourage as many people as possible, especially teachers and their students, to attend the Alliougana Festival every year. Most of the presenters come down for just a few days and this is a unique opportunity to listen to what they have to say and interact with them. It was good to have more participation from school children this time. Well done to Miss Cassell and her hard-working staff and volunteers. 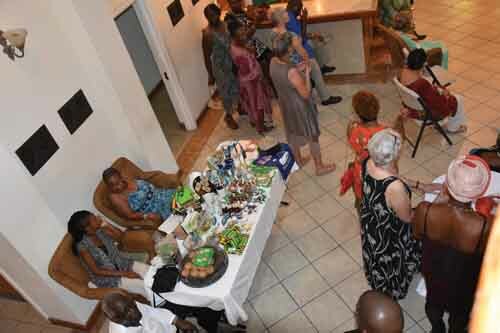 Continued funding assistance from the Montserrat Arts Council and the Montserrat Foundation was a great help, as was fundraising in Toronto and Montreal by Mary Glavassevich and Evans Lewis respectively. Thanks too to Radio Montserrat for helping promote the Festival, and to those who provided accommodation free of charge to the visiting presenters. Committee Chair, Gracelyn Cassell extends sincere thanks to the hard-working members of the Steering Committee and to the Sponsors and Partners, old and new for making the 9thAlliouagana Festival of the Word possible.